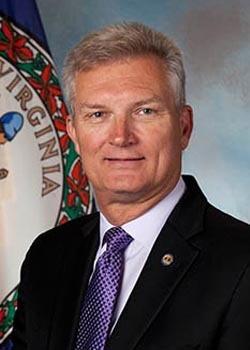 Aubrey Layne, Secretary of Transportation for the Commonwealth of Virginia, will be the keynote speaker for Tidewater Community College’s 61st commencement exercises on Dec. 19 at 10 a.m. at Old Dominion University’s Ted Constant Convocation Center. More than 2,100 students are being awarded associate degrees or certificates. The ceremony will be streamed live. In addition, James K. Spore, who will retire after 24 years as city manager for Virginia Beach, will receive an honorary associate degree from TCC at the ceremony. Gov. Terry McAuliffe appointed Layne, a native of Virginia Beach, to his current position on Nov. 22, 2013. Layne oversees seven agencies with more than 10,000 employees and combined budgets in excess of $5 billion. Prior to the appointment, he represented Hampton Roads on the Commonwealth Transportation Board from 2009 until 2014. Layne also served as president of An Achievable Dream Academy, a unique partnership between Newport News Public Schools and the local business community that provides at-risk students opportunities to succeed. He is the former president and principal broker of Great Atlantic Properties. Layne’s wife, Peggy, who retired in 2010 after 40 years with Dominion Virginia Power, is a member of TCC’s Educational Foundation board and serves as the vice chairman of its nominating committee. She is the former chair of TCC’s Network for Empowering Women Students (NEWS), which advocates for the college’s Women’s Center. Peggy Layne continues to work for NEWS as a network member and mentor. Aubrey Layne earned his bachelor’s in accounting from the University of Richmond and holds a master’s in business administration with a concentration in international business from Old Dominion University. He completed the University of Virginia’s Sorensen Institute for Political Leadership in 2011. Student speaker Justin Ross of Portsmouth will graduate with an Associate of Science in General Studies. He plans to transfer in the fall to Old Dominion University to double major in health administration and history.